Recently I discovered the work of Cathy Callahan (a.k.a. Cathy of California). Her macraméd and tasseled and hand-dyed jewelry pieces are amazing, so I sought her out this past weekend at the West Coast Craft show here in San Francisco. It was so nice to meet her, she's a doll, and such a supportive person. 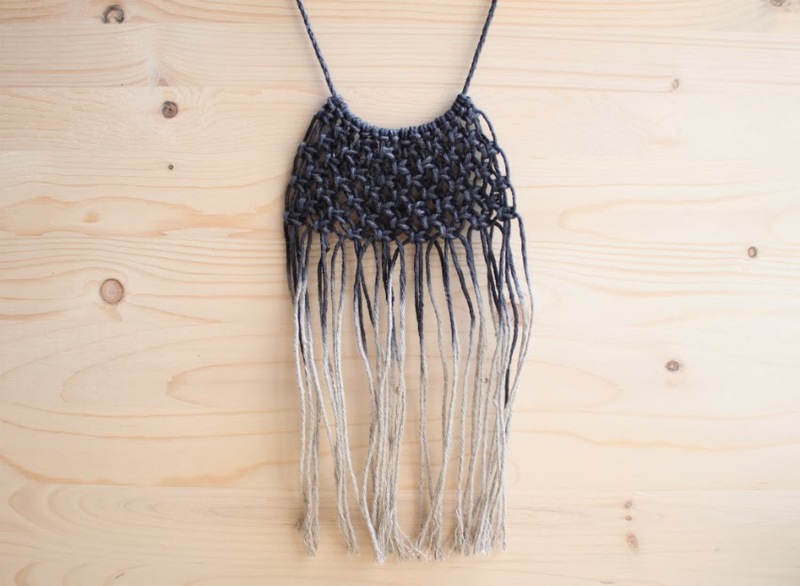 I came home with this totally gorgeous macramé bib necklace and designs to own one of her awesome tassel bracelets in the very near future. I am no trendsetter, but I am so, SO attracted to anything gray, navy or denim in color right now, and the dye colors Cathy uses makes my brain light up! Photo by me. I'm starting to wonder if amateur product photography could be in my future. You can find a list of stockists of her work here, as well as get information on where to find her showing her wares this winter. I'll take one of everything!